Tunnelling has developed surprisingly quickly. This is demonstrated particularly well by the longest rail tunnels in the World, which are currently under construction in Europe. This special issue describes eight important tunnel projects from quite different perspectives – projects from Norway, from the classic tunnelling countries of Switzerland and Austria and from Italy. It thus relates the current state of the art in tunnelling, and how Europe is at least growing together through ever more innovative engineering. Berlin – Palermo is only one corridor where Europe is growing closer – not least due to the longest tunnels in the World, which are currently under construction in Europe. This corridor has been recognised as an important priority project by the European Commission. The intention is to extend the corridor to Malta in the south and to Helsinki in the north. This special issue reports on the creation of the corridor with descriptions of tunnel projects from Norway, the classic tunnelling countries of Switzerland and Austria and Italy. It brings together eight large and important projects and describes them from differing points of view according to their current states of construction. What is possible and what is impossible – and how the impossible is shrinking in European tunnelling, is related for the readers of this special issue of Beton- und Stahlbetonbau (Concrete and Reinforced Concrete Structures). One side effect is a very real picture of the contribution made by tunnelling to bringing Europe closer together. All the articles make clear how large international projects to improve European infrastructure not only depend on modern technical know-how and competent project management in all fields, but also how these projects in particular demand soft skills, which can mean language capabilities, understanding of cultural matters or general communication ability. 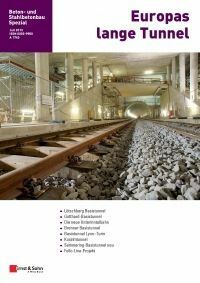 The reader can learn from reading this special issue about the state of the art in European tunnel construction, with hard and soft facts presented in a clear and fascinating manner.